MSP Q sort Challenge - Meet the Challenge! The MSP 'Q sort' challenge is a discursive method through to elicit different perspectives on Marine Spatial Planning. In other words, how planners, academics, stakeholders think and talk about Maritime Spatial Planning. The MSP 'Q sort' is a set of 39 statements about MSP. Respondents are asked to sort and rank them on a scale from -3 (strongly disagree) to +3 (strongly agree) following certain steps and rules of the Q method. The ONLINE MSP Challenge Q sort is done individually during an online (Skype) interview. If you want to participate in the online Q, simply send us a message through the contact page. We' ll schedule an appointment. 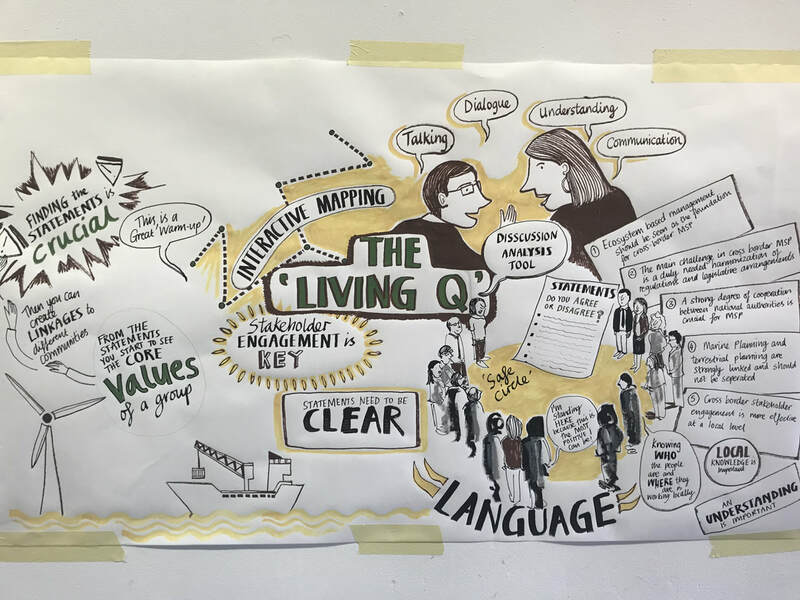 In the LIVING Q sort members of a discussion group literaly take 'position' on a -3/+3 scale laid out on the workshop floor and then discuss their positions and arguments. The method generates plenty of activity, with people moving around, sensing and feeling 'proximity' or 'distance' to other members of their group and community.